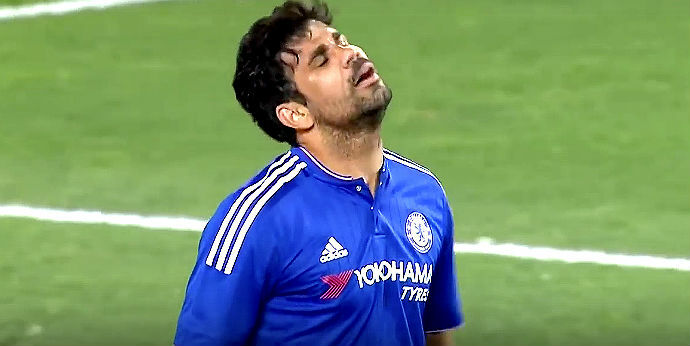 LONDON, Sporting Alert – Diego Costa flicked his warm-up bib at Jose Mourinho after the Chelsea manager opted against bringing on the forward as a substitute against Tottenham. Costa, who was dropped to the bench by Mourinho for the clash at White Hart Lane on Sunday, was told to warm-up by his manager with just under 10 minutes plus stoppage time remaining in the second half. With five minutes left, Costa was still jogging up and down the touchline and stretching away as he waited to be called by the boss. However, it is understood Mourinho was not happy with the attitude of the striker during his readiness and decided against bringing him on — with youngsters Robert Kenedy and Ruben Loftus-Cheek getting the late calls instead. After looking up at the clock and seeing the time running out, Costa took his seat back on the Chelsea bench, before the Spanish international took his warm-up bid off and chucked it towards Mourinho. He was clearly not happy, the striker, and he certainly let the manager and all the viewers on television and around White Hart Lane know it. Of course, the manager wasn’t aware of what had happened, but you best believe the Portugal coach will see the incident that on video at some point in time throughout the course of the day and Costa could very well be in some problems. According to reports, there are problems in the Chelsea locker room and as we have all seen this season, no one is happy with the way the defending EPL champions have started the term. Could Costa be sold in January? If Sunday’s action is anything to go by, then I wouldn’t bet against that happening. But at the moment, Chelsea need to start figuring out how to get back on track to secure a top-four place, as they are now 14 points behind leaders Manchester City.